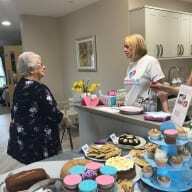 The ‘Time for a Cuppa’ event, which was hosted at Westgate Healthcare’s newly commissioned Riverdale Care Home in Braintree, Essex, was designed to support the SEAN (Support an Essex Admiral Nurse) programme. Guests, including local residents, teachers from the local junior school, residents from the home, old colleagues, friends and relatives, were treated to cakes baked by the Bright Selection team and family and friends. In addition, there was also a ‘Guess the Weight of the Cake’ competition, raffle prizes, and Teatime quiz with a Tea Hamper prize. Over the last 18 months, Bright Selection has raised £3,800 for Dementia UK through a number of fundraising events inspired by the memory of the mother of one of the company’s directors who was sadly lost to the illness. The post ‘Time for a Cuppa’ event raises £469 for Dementia UK appeared first on Care Home Professional.